A week ago I argued that there was "no need to fear Fed tightening," because both bond yields and the Fed were reacting to declining risk aversion and an improving economic outlook. My point: higher yields are not a threat to growth, they are a by-product of an improved growth outlook. This week I change the focus slightly, and look at the behavior of Treasury yields during business cycles. What has happened this year is very typical of what happens as the business cycle matures. The yield curve has flattened somewhat, but it is nowhere near the flatness that typically presages a recession. 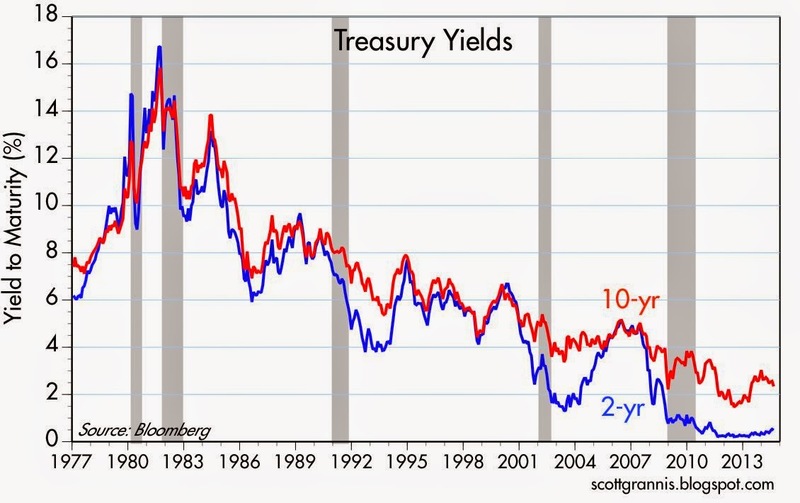 The chart above shows the history of 2- and 10-yr Treasury yields. The long secular decline in yields since the early 1980s has been driven by declining inflation, declining inflation expectations, and, more recently, by slower growth expectations. 2-yr yields are equivalent to what the market thinks short-term interest rates will average over the next 2 years. Rising 2-yr yields are thus a sign that the market is ratcheting upwards its expectations for Fed tightening, because the Fed has a very powerful influence on short-term interest rates. 10-yr yields, on the other hand, are largely driven by the market's expectations for economic growth and inflation. The Fed can influence these expectations to some extent, but not by much. 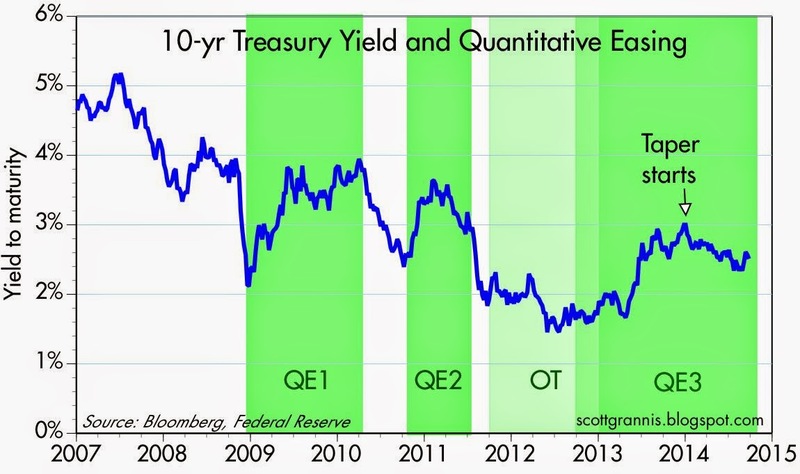 The chart shows that even though the Fed purchased trillions worth of notes and bonds in three rounds of Quantitative Easing, 10-yr yields rose during each episode of Quantitative Easing. Yields rose because the market perceived that the Fed's bond purchases were correctly addressing a problem and thus improving the outlook for growth. Yields fell after QE1 and QE2 because the market realized that the Fed had not done enough to address the world's demand for safe assets, and this threatened the outlook for growth. We now know that QE3 is virtually finished, but yields have only declined marginally, which in turn suggests that this time the Fed has done enough. Some have suggested that the recent decline in 10-yr yields and the rise of 2-yr yields might be the bond market's way of telling us that a tightening of monetary policy next year could prove debilitating to the economy. 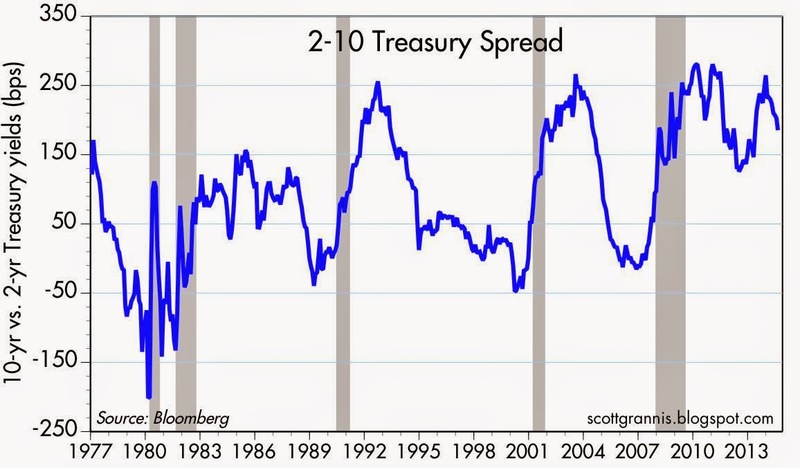 But as the chart above shows, the current spread between 2- and 10-yr Treasuries is still quite wide—the yield curve is still plenty steep. 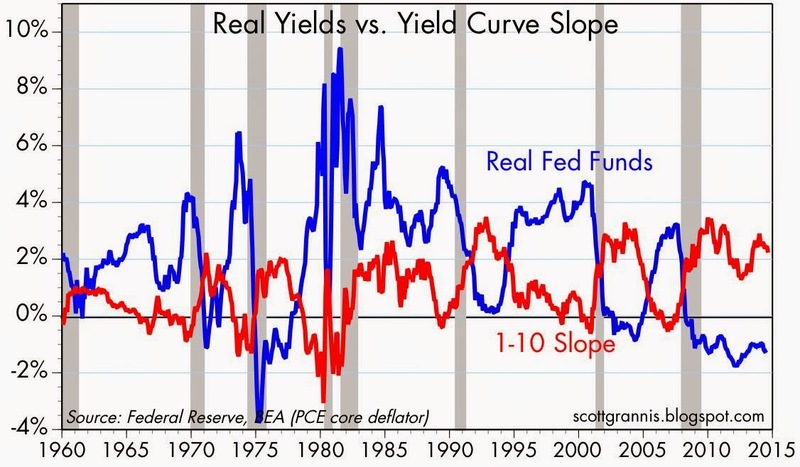 The economy has flourished for years with a yield curve as steep as today's. It's only when the curve gets flat or inverted that the economy is approaching trouble. The chart above shows that every recession since 1960 has been preceded by a severe tightening of monetary policy. Very tight money shows up in high and rising real short-term interest rates (the blue line) and a flattening or inversion of the yield curve (red line). Today both of these indicators remain firmly planted in "easy money" territory. Conclusion: the bond market is not displaying any concerns about what might happen to the economy when the Fed starts raising interest rates next year. In my view, the Fed cannot create growth or a stronger economy out of thin air. It can remove impediments to growth, but surely the economy is not suffering from a shortage of money these days. Even if the Fed could, which I don't think it can, I don't see how artificially depressing interest rates can create growth either. Growth can only come from more work, smarter work, more efficiency, more productivity, and more risk-taking. The problems we have today are beyond the Fed's reach: onerous tax and regulatory burdens, and a lack of confidence in the future. Well...certainly I agree the tax rates should be lower on productive people and regulations the lightest possible...I would like to see a payroll tax holiday combined with aggressive QE to prevent the national debt from growing...or a permanent elimination of the corporate income tax or at least no taxes on dividends. All that said, we are now watching a collapse of 5-year expected inflation rates and a decline in unit labor costs in the second quarter. The Fed may be making the same mistakes as the Bank of Japan, time will tell. First off, thank you for continuing to churn out such valuable content. I've been following your blog for the past 12 months and continue to learn a great deal from each post. Do you have an outlook for where REITs are heading? I'm having trouble figuring out why the Vanguard REIT Index is down almost 10% in the month of September. Given that my goal is to be a long term investor, would you recommend selling my REIT Index shares in favor of the S&P 500 or would you hold? Thank you for any insights you can share. Thanks Tyler. VNQ is probably down because Treasury yields are up. The market worries that higher yields will depress real estate and the economy. I don't agree. I'd be more inclined to sell the S&P and buy VNQ than do the reverse, but from a long-term perspective both still look like decent investments. Scott, thank you for the reply. Your insights are much appreciated.